A new year, a new forum challenge! This time the challenge is fictionnal aircrafts so I will be making the ADF-01 Falken from the Ace Combat series. It is a superfighter that have been developed from the battle data of the duel between Cipher and Pixy in Ace Combat Zero, which are considered to be the two best pilots in the series however the plane has appeared in the saga since Ace Combat 2 where it was depicted as being flown by a computer program called Z.O.E. It features the COFFIN system which allows the pilot to control the plane directly from his mind using a brain-computer interface, allowing a very high degree of control over the plane. The cockpit is also made of screens using cameras and various sensors on the plane, replacing a regular glass canopy and allowing the display of various kinds of data. So yeah, it is a very big and heavy plane, I need to scale it down to at least 1/12 to get a decent size (2 meters by 1.5) and it's still big. I have not yet decided on construction method, probably a mix of cardboard and wire cut foam with some 3d printed parts here and there. 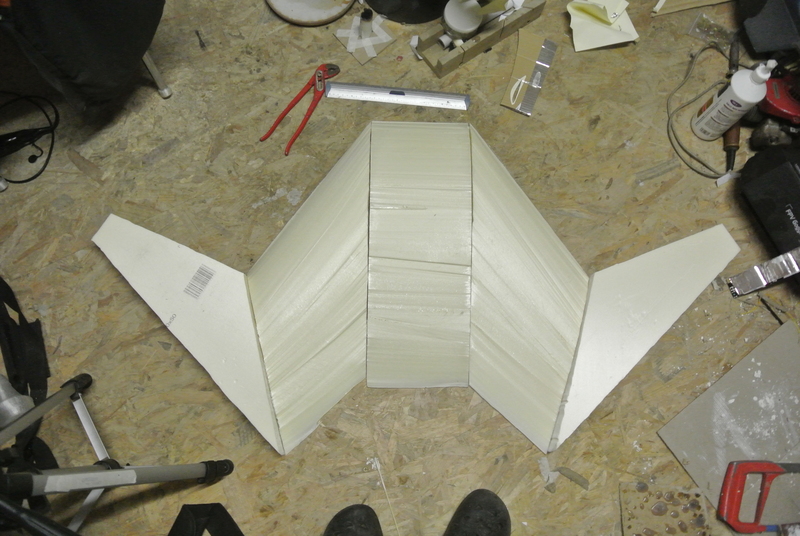 Elevator on canards, ailerons, 2D thrust vectoring (roll and pitch) and rudder. 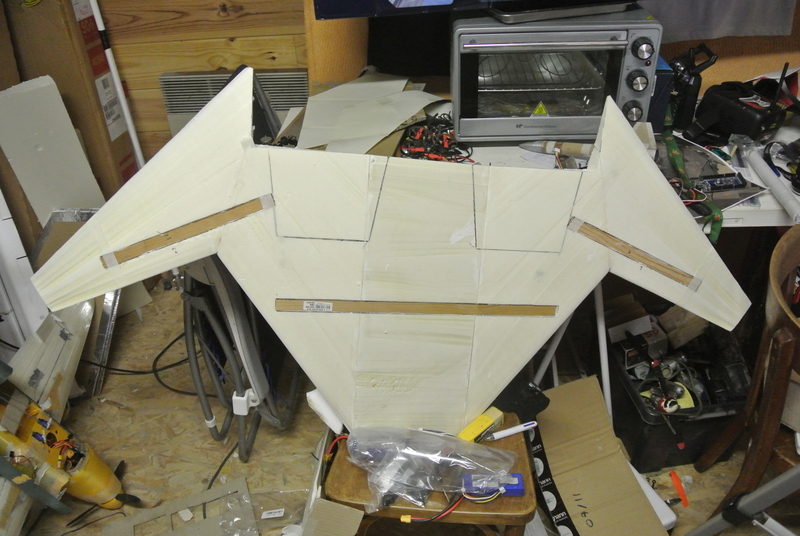 The bottom fin will probably be non functional and held on with magnets because I will have to belly land this thing. If this works out alright it will have a very impressive degree of control because of the canards, thrust vectoring and forward swept wing. I do believe you have the first official build thread of the challenge started - and two days before the challenge thread is even opened up - very cool! J/K, awesome pick. I can not wait to see this together. Eh, last year peoples had planes already flying before the contest started. Im even surprised im the first one to post this time. Well, I haven't done much exept putting the 3 view into fusion. Life and other projects have kept me busy so I don't know if I will complete this in time, im sorry about that. This is a beautiful craft. What chu got so far? Are you going to use a blue led or a fiber optic finger light thingy for the "canopy"? Well, I got exactly nothing done so far because I have been busy with other stuff. I may not finish it for the challenge deadline but it is the first rc aircraft I have been wanting to build since ever so I will do it. Well, since someone else started their own falken build I decided it was time to work on mine and I did more work in an hour than I did in 8 months. The wings will have to be made in 3 panels each, I will probably make the whole front end detachable so I can easily transport it and swap it out when it gets damaged. I will try to get those done whenever I can, I have a feeling I will suffer immensely cutting those. Amazing what I can do in a day if I put myself to it. Those parts were surprisingly easy to cut (or I am getting good) however those outer wing panels will probably be a pain so I will do that tomorrow. Your top view in frame #8 is real nice. Do you have any front, rear, side views? Trying to get a total makeup of plane. That's looking good @Flurburtur! How big will it be? 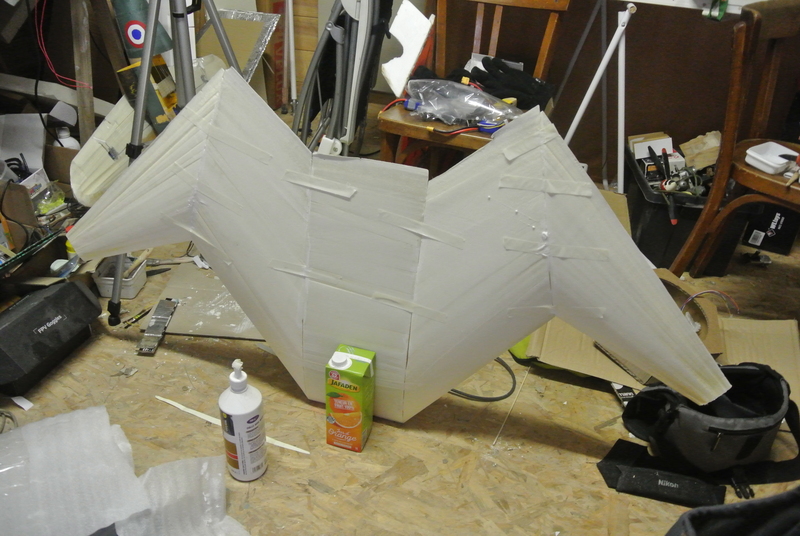 About 1.5m of wingspan and 2m long, I don't know about the weight yet but with that wing area it shouldnt be a problem. 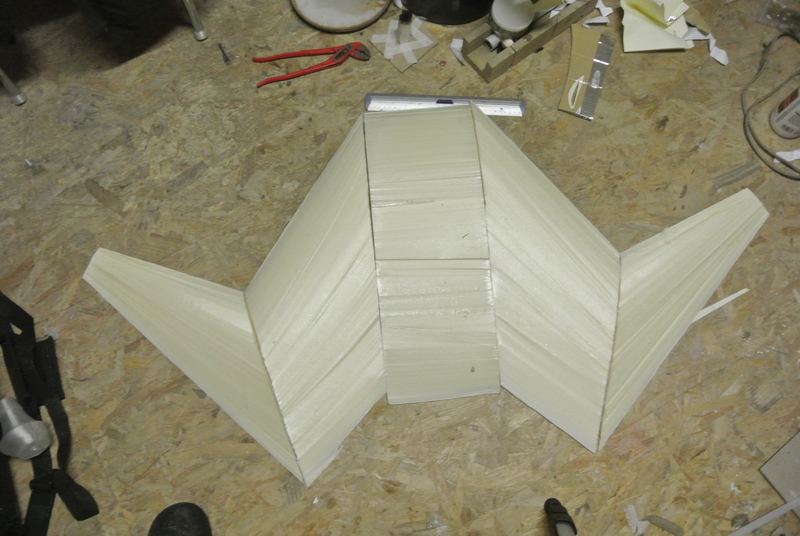 Im done cutting all the wing panels, now I have a lot of sanding and gluing to do. I will probably end up covering most of the plane in poor man fiberglass (tissue paper and white glue) because those wingtips are really thin, less than 5mm and im pretty sure it will need to be strong when I want to disable the G limiter and pull over 12G and destroy the tactical laser system. Wing fluttering is quite common with forward swept wings. Built 2 flying models and each required stiffening. Ended up installing 2 carbon rods in one wing and stiffening the trailing edge of the other with a carbon strip. And I didn't engage my G limiter. Did you see my thread on the FSW using 64 mmEDF? While doing research on FSW, ran across article that talked about difference between leading edge wing angle and trailing edge, basically saying inward flow is changed due to angles? Could not find any wind tunnel data. I built mine to see effect of inward flow over wing and does it ingest into the EDF. Im done gluing the wings together. Now I will have to put the spars and the hardpoints of the engine nacelles and then I will cover it with paper and glue, should be plenty strong then. My friends on the KSP IRC channel wanted me to make videos of my projects so here is the first video of the build. Wait, are you putting real jets in your plane ?! When im rich maybe, this one will have a pusher prop on each engine nacelle and maybe some large EDFs later. Ok, real jets would be really cool though! So, is this one going to have vectored thrust?